Last week of March I found myself in Hamburg, Germany, on a Saturday with a day off. It was an international break so there was no Bundesliga action in any of the top three divisions. But the fourth division was active and so I set to scanning the fixtures list hoping to find a chance to see St. Pauli II in action in the Regionalliga Nord. St. Pauli is a famous German club well known for it’s politics (antiracist, antifascist) and its culture of support which is inclusive, welcoming, and entered around punk music and culture. On my first night in Hamburg I walked down to the St. Pauli fan store on the Reeperbahn and purchased a scarf and chatted with the folks behind the counter. I told them about the Whitecaps and TSS Rovers FC and they enthusiastically handed me a Sharpie and invited me to leave some love on the wall of the store from The Swanguardians. I asked about fixtures on my day off and no one was too sure if the second team was playing. 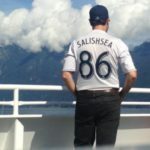 It turns out that there is very little reliable information about the German Fourth Division floating around in English. I thought they might be playing away that weekend in Lübeck, a town 45 minutes north of Hamburg, but it turn out the dates were wrong. Disappointed, I checked the local Hamburg clubs’ schedule and discovered that HSV II, the U21 team of the Bundesliga club, was instead playing away at VfB Lübeck. That was going to be the nearest match, so I rented a car and took off Saturday morning up the highway. Lübeck is an old historic city with a medieval city centre that was bombed to pieces during the Second World War. 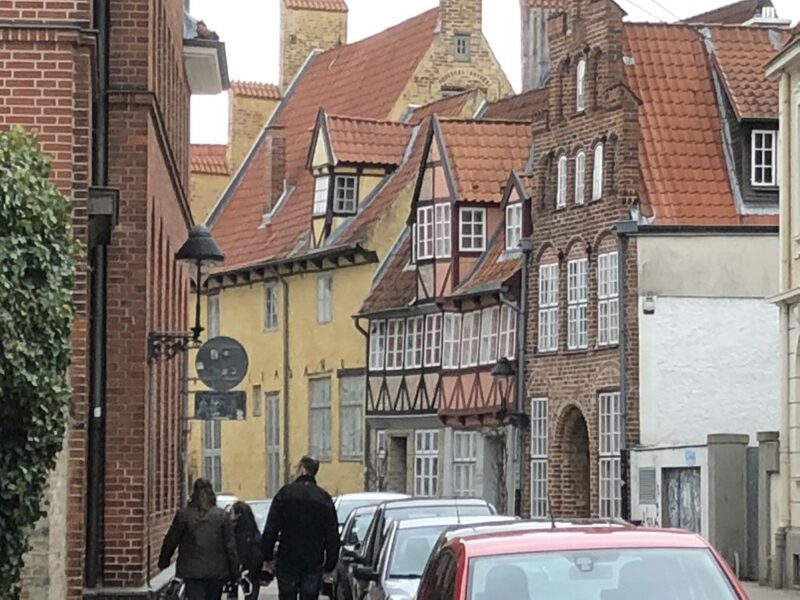 There are lots of older building still standing, including some large medieval cathedrals and houses, but these are filled in with newer buildings built in the post-war period. The football ground is on the outskirts of town, slotted between strip malls and open countryside. It has an old grandstand and a smaller new stand on either side and standing terraces at either end. The home supporter’s section is called the “pappelkurve” named for the row of poplar trees growing along the edge of the fence. The stand was once made of wood and was deemed a fire hazard in 2016 and a saga began to rebuild it. When the club finally got planning permission from the town, the building permit specified that the new terrace not be used by fans. 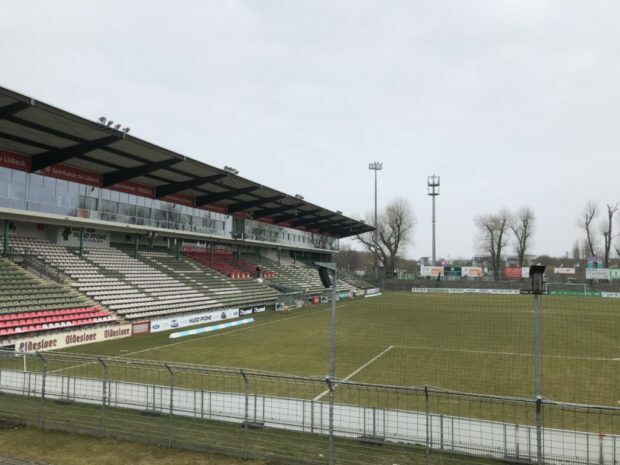 It was a puzzling and odd situation and it meant that the VfB Lübeck Ultras moved their support from the pappelkurve to the north end of the grandstand. The stand was rebuilt, and now home supporters gather there, under a wooden hand operated scoreboard. Supporters groups the world over know what it’s like. Lübeck is a local club and is well supported. Unlike some other clubs in the league like HSV II, Werder Bremen II, and St. Pauli II, VfB Lübeck is the first team of the club. They have had success over the years, winning the league titles regularly in the fifth division and having some rare success in this league. They once famously went to the DFB Pokal Cup semi final where they played Werder Bremen and lost in extra time. The fans live for these small successes, but more importantly they live for the quality on the pitch. 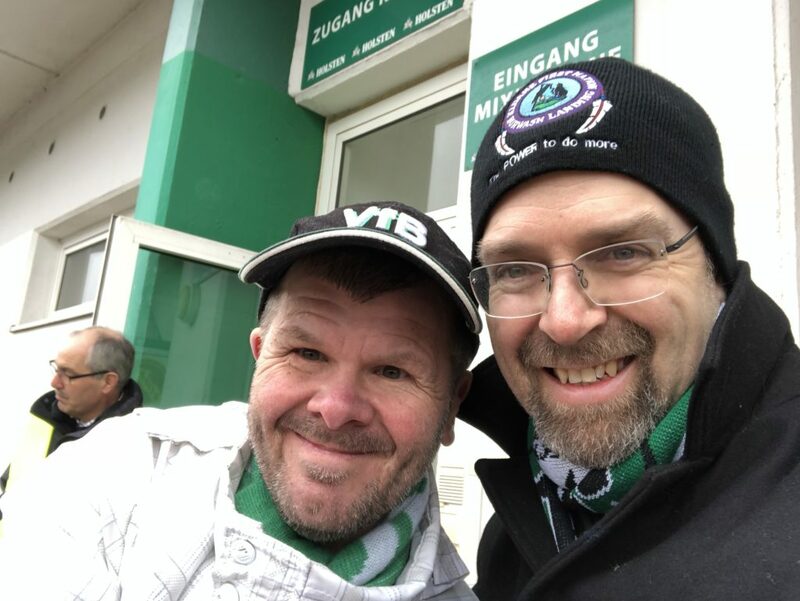 They love their club, made up of local boys and men who travel by bike and walk to their home games, shaking hands with their friends and neighbours as they prepare to go up against the reserve sides of some of the biggest clubs in Germany. The matches against the Hamburg teams have the feel of a derby, although their biggest rivals seem to be from across the state in Holstein. The stadium holds almost 18,000 but hasn’t seen a danger of a sell out for a long time. I arrived early and met the only guy who spoke English, Marco (pictured below), who is a program seller and who collects the autographs of the players from both teams as they arrive. Marco explained in broken English what I needed to do to get a ticket and get settled. I choose a seat near midfield for 16 euros and settled in to watch the atmosphere build. 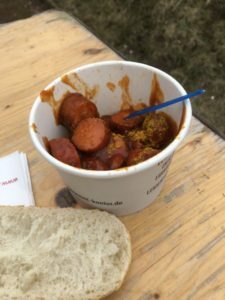 Currywurst and draft glasses of Holsten were the order of the day, with a refund provided for the return of the plastic glasses and paper bowl. Probably 4000 people filed in for the 2pm kickoff, including a crowd of 100 or so HSV supporters. HSV II is running away with the league this season, so although VfB Lübeck has been in great form, this would be a real challenge. It was amazing football. HSV II was fast, with a couple of speedy wingers tearing up the VfB fullbacks. In return the local boys put in tackle after tackle in the middle of the park. They were unrelenting, mostly accurate and unapologetic when they sent the young Hamburgers clattering to the pitch. A lucky goal in the first minute set Hamburg up 1-0 but the Lübeckers didn’t give up. They launched a furious series of attacks with a fierce press that pressured the HSV backline and created tons of turnovers. Nothing got through however and eventually Hamburg settled in and absorbed pressure, using their speed to launch counters and stretch the back line. All afternoon it went back and forth and after the hour the yellow cards started coming in waves. The blood was bad, the home fans were whistling fiercely every time the HSV keeper held the ball. Players were stretchered off, or subbed for limps, and by the time the 80th minute rolled around a red card to the home side all but assured a loss. The game finished 2-0, but the result betrays the fun. Fans in the stands were enthusiastically behind their team the whole way, cheering each tackle, razzing the opponents, taking a strip off the referee. The players and fans mingled afterwards while the HSV boys celebrated with their away contingent. 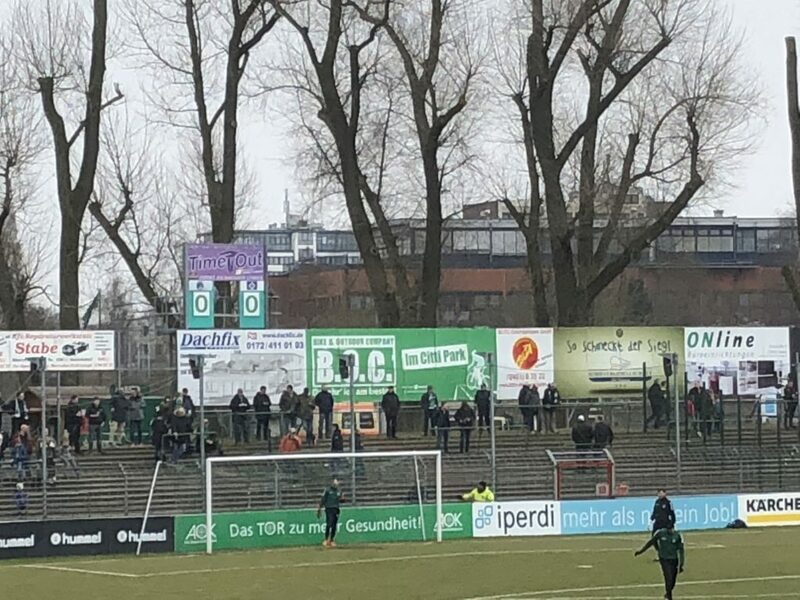 I stayed around until it was quiet again, and the green and white flags came down, the currywurst stand shuttered up, and a U14 game got underway on the neighbouring turf pitch. The spring birds took over the ground again, a few old timers stood around drinking draft and reminiscing – its a club after all – and the rest of the locals got on their bikes and rode home. Great read really can’t say enough how much fun it is to travel to Hamburg and the surrounding areas. I have made many friends from my trips to Hamburg over the years to watch Fc St. Pauli.